Pharma Marketing Blog: Is There a Cure for Mediocre Pharma Mobile Apps? For new pharma marketing Graduates, I have just one word for you. Are you listening? Mobile! According to my currently-running "Predicting the Future of the Drug Industry: 2012 and Beyond" survey, 72% of respondents agree/strongly agree that the next "BIG opportunity for targeted marketing to patients and physicians is mobile apps on smart phones." Until recently there were not many pharma mobile applications out there worthy of writing about. previously. Most marketers were discussing only SMS (text messaging) as the best example of using mobile to motivate people to take their medicine. Boring! FDA Issues Long-Awaited Guidance - for Mobile Medical Apps. Janssen, Look Out! However, most pharma mobile apps that I have seen are pretty mundane as far as marketing/advertising is concerned. There are a few that focus on consumers such as the Sanofi-Aventis GoMeals app, which IMHO has absolutely no marketing ROI for S-A although it is only one part of an overall marketing plan to position S-A as a player in the diabetes area. Other apps are aimed at physicians, such as Janssen's "Psoriasis" (PASI) app for the iPhone and iPad that may need FDA approval as a medical device (see here). There are no pharma apps that I know of that directly help to sell drugs or vaccines. 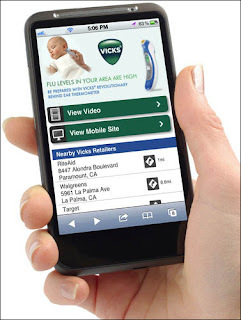 I mention vaccines because I just found out about a P&G "Vicks" branded mobile app/device combination that could be a model for improving the sale of vaccines, especially for the flu. It's a mobile advertising campaign for a behind-the-ear thermometer by Vicks that is "designed to display the ad only in areas where there is a high incidence of the flu and only to mothers, the primary purchasers of thermometers" (see "Using Google Data on Smartphones to Target Consumers for Ads"). Couldn't an app like this be created by a pharma company to promote its flu and other vaccines? Or even OTC medicines during allergy season? Perhaps even Rx drugs if Google had the right kind of targeting data? There are, of course, some regulatory hurdles to overcome. Since the Vicks app is integrated with a device (thermometer), perhaps it should be regulated by the FDA as a medical device. Another challenge is the relationship between Google and the pharma industry. While Google is bending over backwards to provide help to consumer goods agencies about how best to do display advertising via its network (see "Google Increases Investment in Display Ads"), I don't think Google is providing the same level of services to pharma agencies. A representative of Google recently said "pharma needs to leverage the Internet" and that "pharma was not considered a key client by Google because of pharma’s low spend" (see here). To create truly useful mobile apps that have ROI, pharma needs to invest more in interactive media overall. Otherwise, it will continue to develop marginally useful apps that are used once and then forgotten, IMHO.